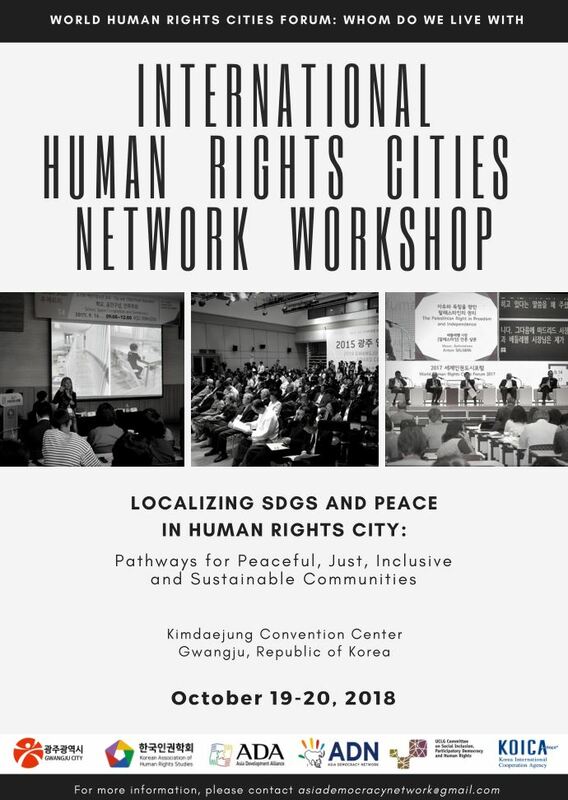 The workshop will be held in Gwangju, South Korea, as part of the 8th World Human Rights Cities Forum (WHRCF) (18-21 Oct. 2018) www.whrcf.org. International Human Rights Cities Network (HRC-Net) Workshop is a joint initiative by the Gwangju Metropolitan City, Korean Association of Human Rights Studies (KAHRS), Asia Development Alliance (ADA), and the Asia Democracy Network (ADN) in partnership with the United Cities and Local Governments (UCLG) Committee on Social Inclusion, Participatory Democracy and Human Right (CSIPDH, HR Committee) and Korea International Cooperation Agency (KOICA). The primary goals of the Workshop is to develop a long-term action agenda for human rights cities in line with the resolutions and recommendations from the relevant UN human rights mechanisms especially the United Nations (UN) Human Rights Council (HRC) as well as the Gwangju Guiding Principles for Human Rights Cities adopted in 2014 in the context of the UN 2030 Agenda for Sustainable Development / SDGs.